Saw in store in Guildford (High Street) but online also. Seems like a good price for the Smart Box. Good price! I paid £25 to Asda a few months ago in their sale. Great bit of kit for the money. The freeview receiver (standard rf ) works really well. We had our samsung connected to an indoor aerial and we struggled to get a signal, plugged one of these in and works great. Seen it on another post. Wouldn’t that be better if you planned on keeping the subscription? Sky's basic bundles aren't in hd, either. You can always pick up now TV passes for a lot cheaper than a sky subscription. Sky's basic bundles aren't in hd, either. You can always pick up now TV …Sky's basic bundles aren't in hd, either. You can always pick up now TV passes for a lot cheaper than a sky subscription. Been using Now TV for a few years now, and it is definately the cheapest way to get plenty of TV and film.. (edit: and sport). Bought. 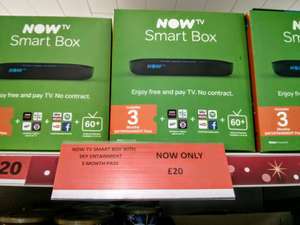 Three months Entertainment Pass, £5.49 Sky Store Voucher and Smart Box which CeX would pay £11 cash for. Great bit of kit for the money. The freeview receiver (standard rf ) works …Great bit of kit for the money. The freeview receiver (standard rf ) works really well. We had our samsung connected to an indoor aerial and we struggled to get a signal, plugged one of these in and works great. That's what I've been wondering about...I don't have an outdoor aerial for freeview, thought I might try one with this. Do you mind telling me what indoor aerial you have? I know a lot depends on my location rather than the aerial, but it's hard to get a grasp of which indoor aerials are any good because reviews for most online are so mixed for nearly every one! Want to kick sky into touch . Wondering about the aerial connection for the smart and the standard now TV boxes. what ariel connection do they each have ? Does the box have a standard TV aerial connection so you can access freeview without an internet connection? Thing of getting the box for the passes and giving the box to my Mum to replace her aging freeview box. Reception good. A cheap way to get Freesport and Freeview HD if your current setup does not do DVB-T2. Good price. £22.50 in Asda. I notice that there are two versions of the box doing the rounds at the moment. One like the picture in this deal with the blue logo and another which is more rounded and thicker. Do they both have a freeview HD tuner? I notice that there are two versions of the box doing the rounds at the …I notice that there are two versions of the box doing the rounds at the moment. One like the picture in this deal with the blue logo and another which is more rounded and thicker. Do they both have a freeview HD tuner? Can you connect Digital or DVB-T or both? Deal posting newbie! This is Gubbinski first deal post. Help out by leaving a posting tip or just to show your appreciation for their contribution.